It is very possible that this post will change your life. That you may have an epiphany. That you may discover God’s gift to man. It takes some serious balls to back up a claim like that. But believe me, you’re about to get just that. I’d like to introduce you to Triple Chocolate Fudge Brownie Batter Truffle Balls. Wow, those balls sound like a mouthful. That’s what she said…? Uhh yeah. Or maybe that’s what I said, right as my maturity launched itself out the window. Chocolate3 will do that to a girl. But I digress. Let’s stop trifling and talk about truffles. For truffles such as these, it’s all about decadent simplicity. Fudg-errific brownies are crumbled and combined with sweet, creamy clouds of vanilla to create a playful dough batter. 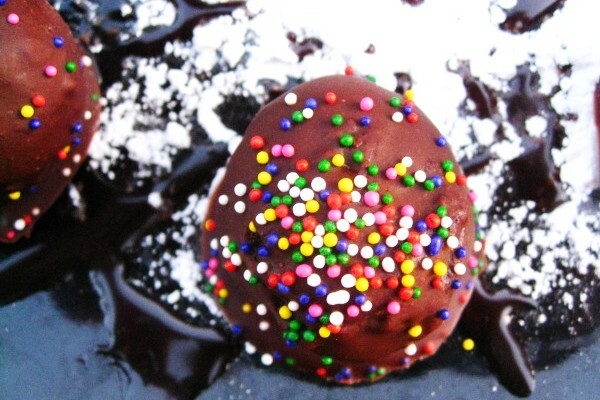 Shortly thereafter, each ball of goodness is dipped in buttery chocolate and kissed with sprinkles. These are fan-flippin’-tastic. Today, we’re going to call them nutritious vegetables. Nutritious for the soul? Indeed. As a bonus, I can nearly guarantee that people will come running at you like you’re offering up a platter of shirtless George Clooney. They may even be better than George Clooney. Excuse me, did I really just say that? Oh my. Please just drop what you’re doing and make these NOW. These balls are the secret to becoming the cool kid on any block…even in D.C.. These balls may result in attempts to bathe in swimming pools of melted chocolate (invite me!). These balls are a spherical feat of dessert nature—like fireworks, explosions of happiness, and bow chicka wow wow fell in love. *I used an 8×8 pan of brownies, which gave me 9 medium brownies. You can use either store-bought or your favorite homemade brownies. In a large bowl, crumble the brownies until all pieces are the size of small pebbles. Add the butter and cocoa powder, and then, mix vigorously with a fork to combine until a wet dough is formed. At this point, take a heaping tablespoon of dough, and roll it into a ball. Repeat until you’ve used all the dough. Place the bowl in the fridge to chill for 1-2 hours, or until dough is firm. After 1-2 hours have passed, melt chocolate and butter in a double boiler. Be careful not to burn the chocolate. 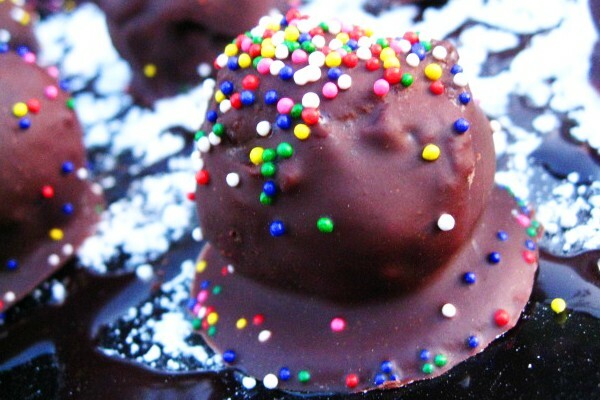 Using a fork, dip each ball into the melted chocolate, coating all sides evenly. Place the balls on a cookie sheet lined with wax paper. Dust the top of each truffle with sprinkles. Put the cookie sheet in the fridge. Chill the truffles for 1-2 hours, allowing the outer chocolate shell to harden. Voila! Serve, and relish the snazziness of a chocolate epiphany. Lexi Cotcamp is a freshman at Georgetown University who thinks that vegetables are the shizz and dessert is the bomb. A business major of the undeclared variety, Lexi thinks the world needs to spend more time eating breakfast for dinner, cuddling with ingeniously oversized teddy bears, and basking in the sunshine of an unseasonably warm spring. Categories: Campus Cooking, Recipes, and Snacktime. Cooking Method: Make Ahead and On the Stove. I Don't Have Any: Cooking Skill and Money. I'm Cooking For...: Birthday, Easter, Frat Party, Late Night Snack, Myself, and New Year's Eve.